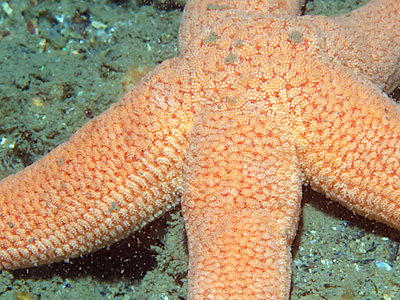 ECHINODERMATA : FORCIPULATIDA : Asteriidae STARFISH, SEA URCHINS, ETC. 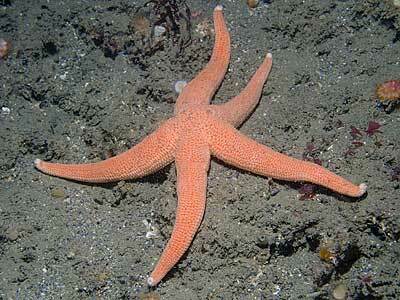 Description: This starfish has five long stiff tapering arms with a regular linear pattern of rounded plates on the dorsal surface. It is orange in colour, sometimes brighter, sometimes more yellow. Up to 15cm across. 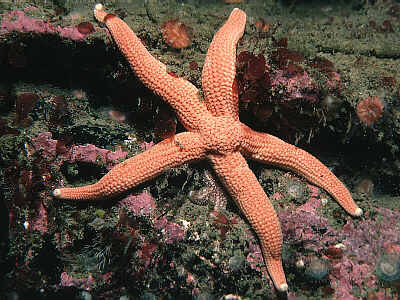 Habitat: An uncommon species, may be found in rocky exposed or moderately exposed sites, mostly below 30m depth. On the west coast of Ireland it is most common on limestone seabeds. Distribution: Apparently a northern species in the British Isles, occurring on the Atlantic coasts but rarely recorded from the south coast of England. Similar Species: Henricia oculata can occur in a similar colour form but has a more sandpaper like, spiny texture. Reticulate plated appearance to arms. Yellow to orange-red plain coloration. Picton, B.E. & Morrow, C.C. (2016). Stichastrella rosea (O F Müller, 1776). [In] Encyclopedia of Marine Life of Britain and Ireland.